By incorporating recently available remote sensing data, we investigated the mass balance for all individual tributary glacial basins of the Lambert Glacier-Amery Ice Shelf system, East Antarctica. 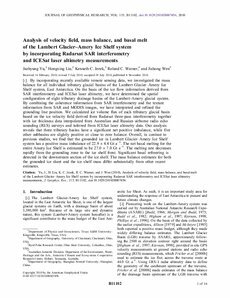 On the basis of the ice flow information derived from SAR interferometry and ICESat laser altimetry, we have determined the spatial configuration of eight tributary drainage basins of the Lambert-Amery glacial system. By combining the coherence information from SAR interferometry and the texture information from SAR and MODIS images, we have interpreted and refined the grounding line position. We calculated ice volume flux of each tributary glacial basin based on the ice velocity field derived from Radarsat three-pass interferometry together with ice thickness data interpolated from Australian and Russian airborne radio echo sounding (RES) surveys and inferred from ICESat laser altimetry data. Our analysis reveals that three tributary basins have a significant net positive imbalance, while five other subbasins are slightly positive or close to zero balance. Overall, in contrast to previous studies, we find that the grounded ice in Lambert Glacier-Amery Ice Shelf system has a positive mass imbalance of 22.9 ± 4.4 Gt a-1. The net basal melting for the entire Amery Ice Shelf is estimated to be 27.0 ± 7.0 Gt a-1. The melting rate decreases rapidly from the grounding zone to the ice shelf front. Significant basal refreezing is detected in the downstream section of the ice shelf. The mass balance estimates for both the grounded ice sheet and the ice shelf mass differ substantially from other recent estimates.